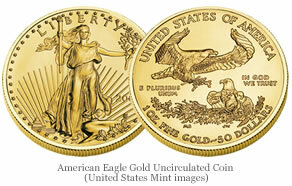 Just two 2008-W American Eagle Gold Uncirculated Coin options remain from the United States Mint. The one ounce size sold out, and was pulled from the Mint storefront Wednesday. A backorder shipping date had been assigned to the coin since Tuesday. Based on recent trends, that assignment has been an indicator for a fast approaching sellout. The Mint price guide shows 8,591 of the coins have been sold, plus the 2,997 included in the 4-coin set. New sales figures will be out later in the week. The remaining 2008-dated gold coins in the American Eagle series include the 1/2 and 1/4 ounce options. The latter has a Mint backorder shipping notice of 3/05, and is likely to disappear soon. Neither of these collector coins will be issued in 2009. The Mint announced late last year that each would be eliminated from its numismatic portfolio. Also still available is the 8-8-08 Double Prosperity Set, which contains two one-half ounce gold coins, an American Eagle Uncirculated Gold Coin and an American Buffalo Uncirculated Gold Coin. Additionally, all 2008 First Spouse Coins are listed on the Mint’s website. The only 2009-dated gold collector coin the Mint currently offers is the Ultra High Relief Double Eagle. Gold prices climbed Wednesday, with New York gold just $26 below the yellow metal’s all-time high. I have a question, I have a 2008 W one quarter ounce gold uncirculated coin that I purchased from the U.S. Mint. I have been searching for the actual mintage and if this coin is considered the lowest mintage of all 1/4 oz. American gold eagles. Could you help me in my search? any information you can afford me would be greatly appreciated.